Lena is an average, small-town girl who runs into (literally) an anything-but-average guy and finds her world completely upended. She is ordinary. He is related to ... I can't tell because it would spoil the plot twist ... non-human beings, we'll say. Lena soon finds that being dumped by her jock boyfriend was the least of her worries. Allie Duzett is a newcomer to the ever-growing world of YA fantasy. I've loved the genre for a good-long while, so I've done my share of reading in it. 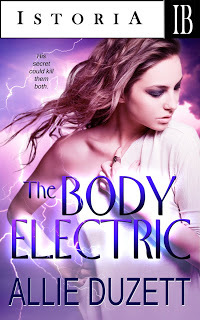 Things I enjoyed about The Body Electric: it is good, clean fun. The plot is fast-paced enough to keep a reader's attention. And Zach, the protagonist, was very lovably clueless and good-hearted (and good-looking, natch). His scenes were extra entertaining. Things I didn't love: the revelation about Zach's true nature completely blind-sided me. Which is why I won't spill it here. I felt like it wasn't built up to well enough. The first half of the book was totally different from the second half of it. There wasn't enough world building. I mean, it's not a long book, so an author's limited in that way. Anyway. I just didn't see the second half of the book coming. Still---good, clean fun. Kudos to the new author!